Even by their usual high standards, those wonderful people at Capsule have excelled themselves with this show. Tonight they have laid on for us two hours of the finest Krautrock, in one of Birmingham's best venues. The night kicks off with one of my favourite local acts, who prove that you don't need to be German to play Krautrock. I've been meaning to write something about Einstellung for a while now, and their outstanding performance tonight has finally given me the incentive to do so. I have seen them live many times, but usually in small venues. To witness them playing the Town Hall, with the powerful sound system that their music deserves, is a real treat for me, and I suspect for them as well. Einstellung's sound is based on the driving rhythms of 1970s Krautrock, Neu! in particular, but they also remain true to their Birmingham roots by incorporating solid metal riffs that could have come straight from an early Black Sabbath album. This heavier aspect is partly due to the members' history in a number of local bands, in particular Steve Hough's involvement with Cable Regime and Godflesh. Einstellung's debut album, "Wings of Desire", would surely have made it into Julian Cope's top 50 Krautrock records, had it been available when he compiled the list. Their second album is due soon and tonight we get a sneak preview as they play a set consisting mostly of these new numbers. The only piece that is familiar to me is the opening number, "Und Die Ruhe Ist Donner", which also appeared on the recent Audioscope charity compilation. The first thing that becomes apparent as they begin their set is that their music, which I had always considered to be one of the most powerful live experiences anyway, is so much more effective when played through a big set of speakers. It's so loud that I actually need to remove my hearing aid as it's starting to generate feedback. They also benefit from having a larger stage on which they can move around, and I find I can watch each member in turn, giving me more of a feel for who is responsible for each of the individual elements in their sound. Most of the heavy riffs seem to be provided by Andrew Parker, while Andrew Smart adds more subtle melodic elements on top, although I have a feeling they sometimes swap roles when I'm not paying attention. The twin guitars are underpinned by Steve Hough's bass, which contributes directly to the Neu! feel. It's easy to forget Si Rider sitting at the back, but his solid drumming keeps the whole thing on track and stops it from descending into a messy free-for-all. Perhaps the most impressive aspect of their live show is how they work together and everyone instinctively knows when to change tempo or move into the next phase of a song, without giving each other any visual cues. Their shows often feature a film projected behind them, which tonight seems to be "Scott of the Antarctic", and a lot of the sudden musical shifts seem to occur at the same time as scene changes in the film. That they manage to do this without looking at each other or the screen is incredible to me, as a non-musician. All of the song titles are in German, and the band recently explained that, as instrumentals, the songs aren't really about anything at all so there is no point giving them titles in English that might impose an interpretation that was never intended. So for once, I don't feel the need to look for hidden meanings in the songs and instead I can just sit back and let the sound wash over me. The predominant sensation that I get from any Einstellung song is a solid rush of adrenalin that lasts for the song's entire length, which often exceeds ten minutes. This is how I imagine it feels to take hard drugs. I am grateful to Einstellung for providing this experience in a legal format and without any lasting ill effects on my health. I could happily watch Einstellung all night, but eventually they have to wind down so they can vacate the stage for Cluster. The duo of Hans-Joachim Roedelius and Dieter Moebius have been making music together since 1971 and as they wander onto the stage it occurs to me that they are possibly the oldest performers I've seen live. Roedelius is well into his seventies, while Moebius is, I think, slightly younger. They prove that age is no barrier to creativity as they generate haunting sounds every bit as imaginative as their early albums. The music they offer us tonight is the complete opposite to that of Einstellung and also the perfect antidote. I still haven't quite come down from the buzz of the first set, so Cluster's gentle, drifting sounds help me to unwind. While Einstellung could be said to represent a high-speed motorway drive across Germany, with Cluster I feel I have reached my destination and am now relaxing by the pool. I haven't kept up with all of their releases over the last 40 years so I can't begin to suggest what the setlist might have been. I believe some of it came from their most recent album, "Qua", but I suspect large parts of the show were improvised. They play from behind a wooden table and the equipment they have at their disposal is hidden from those of us sitting near the front, due the relatively high position of the stage. I'm not sure if they are using synthesisers, laptops, tapes or CDs. I would guess that most of their gadgets are modern, but it is possible that they have retained some of the vintage machinery that would have been up-to-date when they started out. However, it matters not what tools they use, as the effects are mesmerising however they are created. Watching electronic music played live can often be a strange experience, particularly to someone like me whose formative gigging years were spent watching the traditional rock band format. It often seems pointless watching someone lean over a laptop and not engage with the crowd at all, and I find that electronica is usually something I choose to listen to at home rather that see live. While Cluster's performance doesn't feel like the live gigs I am used to, it's still a rewarding experience. I feel privileged to be here because at times it seems like I am intruding on a very private moment. It is as if I have stumbled into the laboratory of two reclusive scientists and witnessed their secret experiments. They occasionally exchange comments that are inaudible to the audience (there are no microphones) and smile at each other, as if they have discovered, by chance, the exact combination of sounds that they have been searching for. It is obvious that they are enjoying the performance every bit as much as we are. 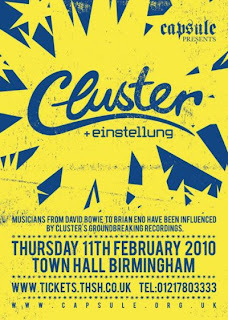 Cluster are perhaps better known for their wide-reaching influence than their own music. Watching them tonight, I am constantly reminded of more recent music in my collection that owes a huge debt to Roedelius and Moebius, whether that is their releases as a duo or their groundbreaking work with Brian Eno. A recent show by Murcof that I attended at the Hare and Hounds, the works of Portal that I reviewed at the end of last year, and more underground acts such as Coil or Psychic TV are the most obvious examples to me. Even the shoegazing bands of the early 1990s, despite relying mainly on guitars rather than electronics, have something of Cluster in their swirling textures. Music fans who listen to anything that is remotely "experimental", even relatively mainstream acts such as Radiohead, will find plenty that is familiar to them here. By the end of the show, I am nothing short of amazed at how much these two elderly men have shaped modern music, while remaining relatively unknown themselves. The two sets tonight demonstrate the wide range of music that can be filed under the general heading of Krautrock. If asked to define the genre, most people would probably mention the so-called "motorik" rhythm favoured by Neu! However, there are many bands that fall into the Krautrock category without coming anywhere near this recognisable sound, Cluster in particular. If I had been played a few tracks by each of tonight's bands without being told who they were, and then asked to pick which one I thought was from Germany, I would almost certainly have chosen Einstellung. Cluster prove that Krautrock is as much about having an innovative approach as it is about fitting into a pre-defined sound. Capsule made an excellent choice tonight by putting on two bands who are very different in style, but have similar attitudes towards performing and complement each other perfectly. Great write-up, wished I'd have been there! Now listening to Cluster with Eno on Spotify - thanks!